« Is Media Better When Blatantly Unreliable? The show opens with them discussing how it wasn’t really a date, just drinks, just something, but not really a date, and that she was gone for four weeks, which she adamantly insists is not the same as being gone for a month. That stilted slightly dramatized line delivery / dialogue exchange, and that particular brand of theatre wit & wordplay that makes me feel like, YES! I’m home. This is New York. This is New York theatre. This is the real theatre experience. As I sat looking at the minimal set pieces which are rotated and rearranged to serve for a variety of settings/scenes, the somewhat abstract scenic art which depict elements relevant to the themes of the plot, and the way lighting was used to transform the appearance of both, first I thought about what each of these elements mean, what they do for the piece. What are the deeper, broader, metaphorical meanings? What multiple different meanings does the word “phoenix” have in the thematics of the play? But then I thought, am I just trying to hard to “analyze” this? I’m not really a theatre scholar, or a theatre critic, not like some of my friends are. Sure, I can draw upon my art history background, and my experience simply as a viewer of many plays and as a friend of many theatre people, but, really, I don’t have the background in the history of modern(ist) theatre to really be able to say anything properly insightful. And, besides, are these things really meant to be dwelt on? Aren’t they more like background to the dialogue and the action, serving a more subconscious influence upon the piece as a whole? I don’t want to give away the precise details of the plot, for anyone who might wish to go see the show, which I assure you is far more enjoyable than simply reading any summary or discussion of it. But, suffice it to say, there are some rather dramatic events, and conversations, in this two-person show, interspersed with bits of the playwright’s thoughts and commentary on society, on life, on what it all means, on the problems of our world. When I go to the theatre, it is normally to see a traditional Japanese performance, such as Noh or kabuki, or an Asian fusion piece, or the like. So it was a real pleasure, a most welcome change of pace, to see something so standardly American / mainstream for a change. It feels good to be home in New York, to be going to the theatre, to feel like I am engaging in, being a part of, the mainstream New York theatre scene. 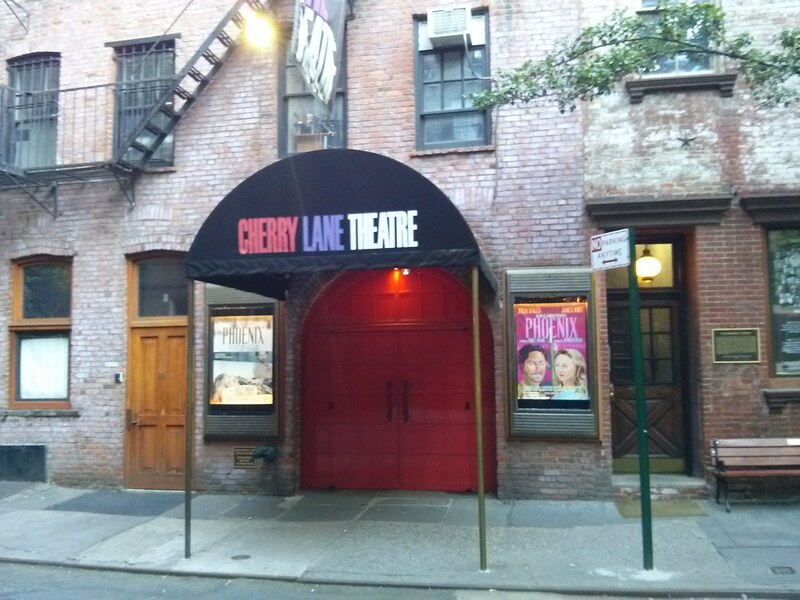 And with the Cherry Lane Theater – New York’s oldest, continuously running, off-Broadway theater – and Julia Stiles, it doesn’t get much better than that. 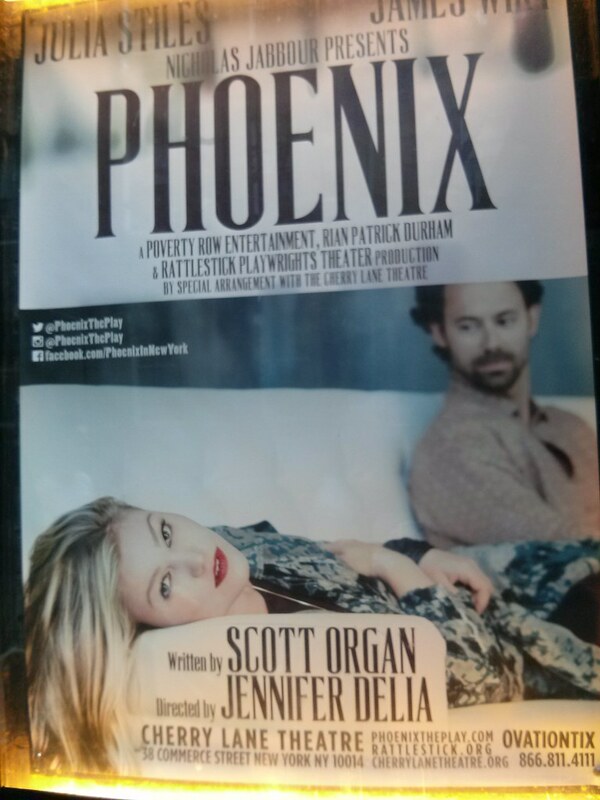 Phoenix runs at the Cherry Lane Theater (38 Commerce Street, Manhattan) through August 23rd.